Sydney, Australia, 18 July 2016 – Abakus Apps, a new finance-based smartphone application and the first of its kind in Australia, launched today. 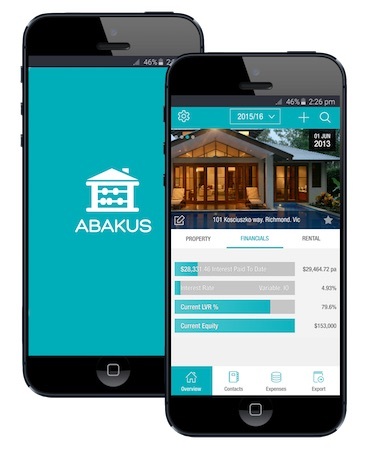 Aimed at everyday Australian residential property investors, Abakus makes property tax management more convenient and efficient – helping users self-manage their investment/s, maximise their tax return and obtain an estimate of their tax position at any time during the financial year. Investing in property offers tax benefits that make real estate an attractive financial venture. Abakus offers a unique set of features for users to keep on top of tax requirements and paperwork associated with property ownership. Property and financial details entered in Abakus enables the app to provide a wealth of valuable information including pre and post-tax position and deductions, rental yield, total running expenses, and cost base tracking of the property. Receipts and documents such as an Offer of Acceptance or a Settlement Statement can also be easily uploaded safely to the cloud. Furthermore, users can enter personal expenses and keep individual income tax-related deductions all in one place. Created by Brenton Tidow, farmer’s son from rural Western Australia turned pipeline surveyor, already has a number of properties under his belt. Abakus came about through the frustration of handling the many pesky expense receipts relating to his investments. Now a budding entrepreneur, Tidow identified a gap in the market for an uncomplicated approach to managing property tax affairs. By selling one of his own properties to finance Abakus, Tidow streamlined a massive, methodical Excel spreadsheet with intricate algorithms into the app. Designed by Monster Apps, Abakus is a subscription app that is cloud-based with a monthly fee of $5.99 for an unlimited number of properties – paid through the iTunes Store or the Google Play Store and is free for the first month. Other accounting software tools available cost approximately $20 a month and bookkeepers charge roughly $100 a month, whereas Abakus offers the whole package for a fraction of these prices and provides investors with significant savings. Furthermore, Abakus gives users control and allows them to be more engaged in their property investment/s through its straightforward and intuitive interface. Abakus is a finance-based smartphone application aimed at Australian residential property investors that makes property tax management more convenient. A comprehensive tax management system with a user-friendly interface, Abakus provides a complete portfolio overview and is a one-stop shop for property investors, to easily and efficiently store and export all required information at tax time or any time during the financial year. For more information, visit www.abakusapps.com.au.